Last May 2009, I decided to test my left ankle that was sprained 4 months back. After doing a couple of rounds at the ULTRA, in 3:20 minutes per lap (400m), I was already panting. From then on, I decided to seriously be in competitive shape again. The first two months of my training was the most difficult. I have to walk 2 laps off the oval first before I run, otherwise, my knees will be very painful. I want to have training sessions 4-5 times a week with at least 5 kilometers per session but my knees and lower back prevented me from doing so. So I settled for a thrice a week schedule at first. I was overweight at 195 lbs. The ideal weight for my 5’11” frame is 165 lbs thereabouts. If I plan to have a decent training program, I need to scale down my weight first. After four months of training, I tipped the scale at 185 lbs. I then gradually increased the frequency of my sessions and built up my weekly mileage from about 10 kms per week last May to about 20 kms by August. From thereon, I started to see hope. The monthly 5k time trials progressed much faster than I anticipated. From 37:30 last June 2009, my 5k by October was at 28:37. At this point, I decided to join races to further accelerate my progress. By January 2010, my weight has gone down to 176 lbs, after 7 months of training. Finally, I can do decent workouts of intervals and repetitions. My 5k time trial (oval) was at 26 mins already. At this point, I just realized that a sub 24 mins for a 5k in my first year back seems attainable. I consider Season 1 as an unexpected gift from God. I originally planned that my first season will be purely training with no road races because I was so out of shape and out of condition. I plan to join races deep into my Season 2 or on November 2010 thereabouts. Never did I imagine that I can run a 26:11 5k (11/22 Botak) after only 6 months into my comeback. This page chronicles my journey back to competitiveness. All for the glory of God! I ended my Season 1 last May 23 due to a foot injury. I originally targeted a sub 23mins for 5k and sub 13mins for 3k before I call it a season, but these goals were left unrealized due to said injury. Analyzing my first running season after a 14 year break, I would still rank it as “exceeds expectations” for two reasons, even though I did not meet my quantitative goals. First reason is that when I began running again last July 2009, I was so out of shape that I did not expect to run a sub 30mins 5k for at least 2 years. Second is the placings that I registered for the shorter races: two 2nd place finishes (one 1 miler and one 2.5K), and a couple of top 20 finishes in the 3k. After two months of rest, my foot is now completely healed. I look forward to a more productive Second Season (2010-2011). This type of race is what I have been wanting to join since I began running again 8 months ago. 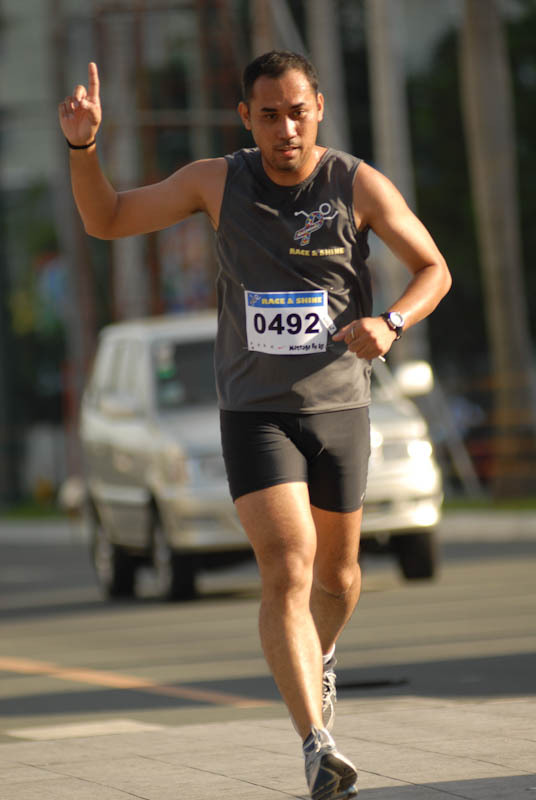 And I think the running gods smiled at me as the race was held right at my training grounds – The Kapitolyo Hills. One loop is actually 1.7km, with only 25% of the route as flat. The rest is 700m uphill with almost 100 inclination, and 600m downhill. I finished second behind a pro – Alley Quisay. I think its because of my mastery of the course that I was able to finish this high. But it really felt good to “fly” in a race once in a while. This was my 10th race of the season, and was quite confident of my conditioning. I gradually tapered down my weekly mileage from an average of 37 kms per week last February to only 25 kms per week in March as I concentrated more on intervals. The first kilometer was approximately in 4:30, but I kind of slacked in the “middle” kilometer. My tapering backfired as my stamina was not as sharp in February. I tried to shift to higher gear in the last kilometer, but due to unfamiliarity with the route, I held back until I saw the finish line with 200 meters to go. 14:33 was not bad for a 3k, though I can definitely lowered it to a sub 14 minutes. Actual race route was 2.5k. Finished 2nd in the 3k, behind UAAP 800m & 1500m gold medalist, Wenlie Maulas. Number of participants are very ideal. Less than 1,000, as a result, race marshalls had full control of the flow of the 3 races (3k,5k and 10k). The surge at the beginning of the race had me placed at number 5, but by the 1st kilometer, I have overtaken 4, with the eventual winner way ahead by almost a kilometer. 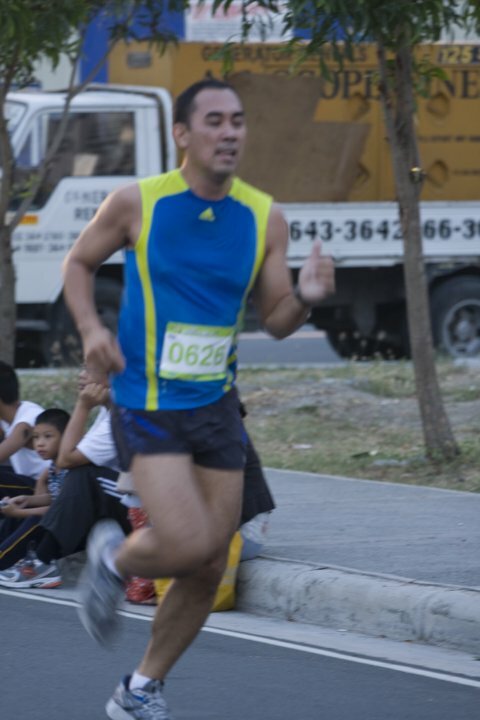 During that stage of the race, I decided to abandon my quest to run a sub 12 minutes and concentrate on my placing. I ran safely from 1km to the 2km point. Then did my usual final kick with 500m to go. Overall, the race was a good aerobic treshhold training. This was my 2nd time to run in a Runrio event, and my 2nd time to commit a blooper. 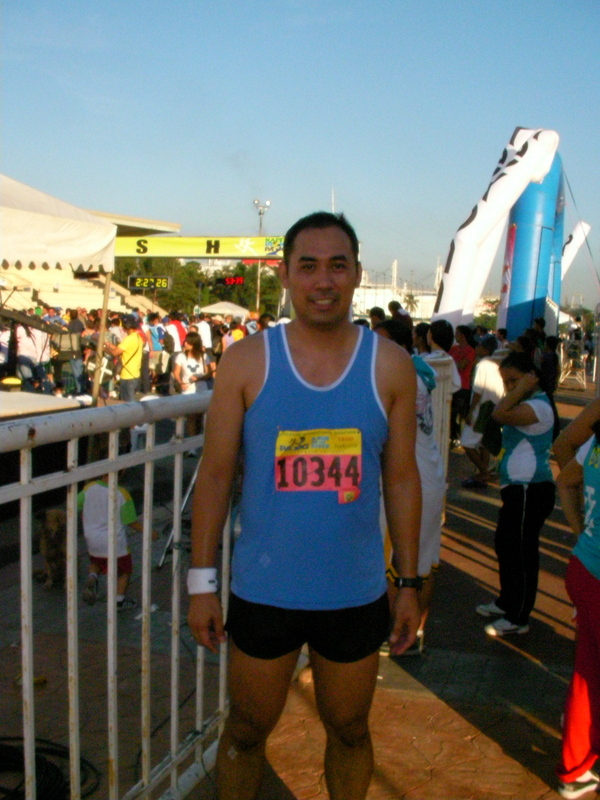 At Timex, I took a wrong turn that had me running an extra kilometer for the 5k race. This time, after having difficulty finding a parking space, I quickly warmed up. After 20 minutes or so, I decided to go to the BHS CR before checking in at the starting line. I then took my sweet time going to the starting line & did some stretches again, only to find out that the 5k race was fired off, 10 minutes ago, exactly the time I am relieving myself at the CR. While trying to catch up during the race, I tired to console myself that at least, my REAL 5k performance will still be captured because of the timing chip. Everything went well until the first kilometer which I covered in 4:33. As I’ve catched up with the tailend runners, my pace drastically slowed down because of the sheer number of slow joggers. By the 2.7km mark, my time was 13:29, meaning I have covered the next 1.5 kilometers in a pedesrtian 8:56. At that point, I already know that my target of a sub 25 is not anymore realistic and concentrated on playing a numbers game – pass as many runners as I can. I’ve lost count along the way but thanks to Runrio’s Runpix, final results placed me at finisher number 850 among 1890 male 5k participants. That means from dead last, I was able to pass 1,000 runners, more or less. But I’ve learned my lesson. Next time I join a Runrio event, I will settle for a 3k race as the number of participants is a great barrier in achieving a personal best for races 5k and up. Because I checked on the race route days before the race, I was able to devise a race plan that helped me use my energy the most efficient way and thereby helping me land another top 20 finish. There were two uphills in the course, both situated towards the last 1 kilometer of the race. The first 1.5km was relatively flat with one downhill. At this point of the race, I tried building up my distance as a cushion against other runners. With the first of the uphill (with a 90 degree inclination over 50 meters) in less than 300m, I slowed down a bit and conserve a little energy. I passed 3 runners and just sailed along for the next 400m as I ready myself for the next uphill (45 degrees inclination over 100m). After I passed the second uphill, I got nothing left and just sailed along until the finish line. No kick in the last 500m. Just a brief burst with 100m to go. I should have not taken out the hill runs yet in my training. It’s just a pity that no results were released. Actual race route was 4k. I was very frustrated with this race as the original race route for the 3k (as posted in the PSE’s website) was changed without prior notice. Because I personally checked the race route prior to race day, I have somewhat gauged where to start my final kick (usually with 500m to go). With about a kilometer to go (based on the original route), I was running 10th, I was zeroing on 2 runners, about 80 meters ahead of me. With about 500m to go, or so I thought, I started my kick, but alas, we (together with 4 runners) were wrong. The leadpack was about 4 minutes ahead of us with no runners in between us, so have no guide and we’re at a loss. We ran again and tried the next bend, again it’s not the right route. At this point I was totally frustrated and tired I walked for about 30 seconds to get my bearing again. When I started running again, with about 800m to go, I was way out of the top 20, I was able to pass 3 or 5 runners in the last 200m. Have there been enough race marshals at the key bends of the route, runners would have informed accordingly. 20 minutes for a 4k, not bad for a comeback kid. But I should have fared better. a. Bib numbers not marked at the start of the race – So if one brave soul decided to join the race at the middle of the route, he will not be definitely caught. b. No straw being given at the designated u-turn slots – It’s already bad enough that bib numbers are not being marked as proof that you started at the designated starting line, but this is very ridiculous. A road race based on honesty system. At least that’s a first on Philippine road racing. 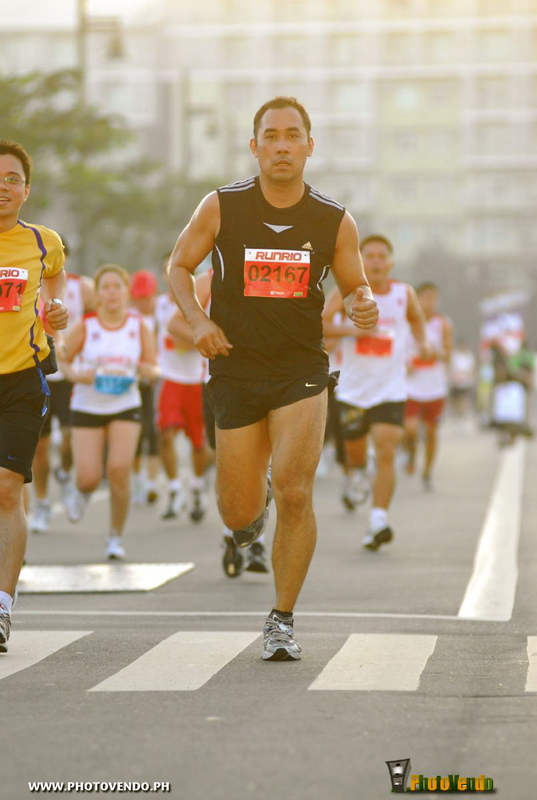 c. Not enough briefing and orientation for race marshals – I have personally witnessed runners stopping at a junction, to asked, a supposed to be marshall of the race, where the u-turn slot is, but to my horror, I’ve heard the marshall replied “di ko po alam”. As a result, hundreds of runners started to run back to the finish line, without reaching the proper u-turn slot. This happened approximately 1.5 kilometes away from the starting line. That means a lot of 5k runners ran only 3k. There were approximately 40-50 runners ahead of me by the 2.5km mark, but because of the confusion, I will not be surprised if my final ranking will be in the 200s. Unfortunately, no final results were released. As if putting a punctuation on a perfectly chaotic race. No hi-tech race route multimedia presentation before the race, no timing chips, just the old-fashioned way of organizing a roadrace. And it’s still one of the best organized race I’ve participated in this 2009-2010 season. Race marshals though not that many, were in perfect control of the runners flow. There’s no way you can lost your way in the race as they are properly situated at key junctions, and they keep on shouting the directions for each race category. 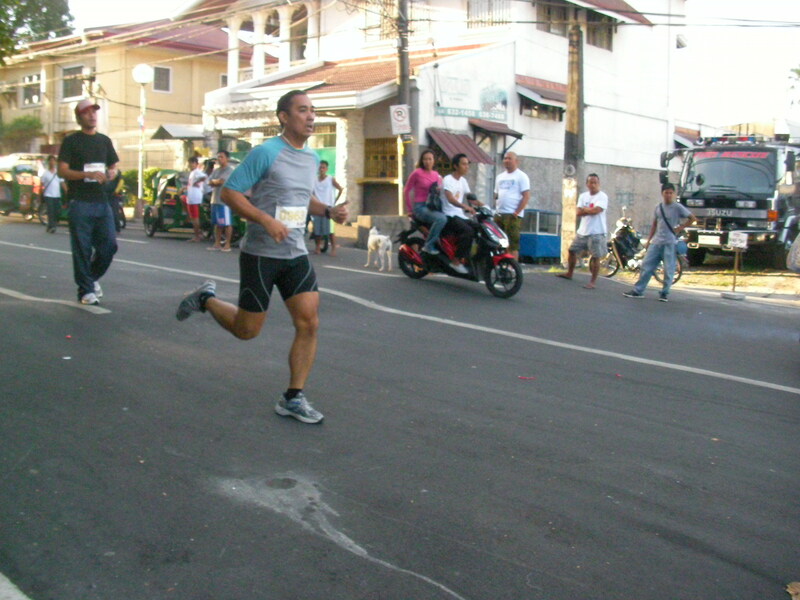 The race director (Mr Franco Atienza) was hands on for most of the race. 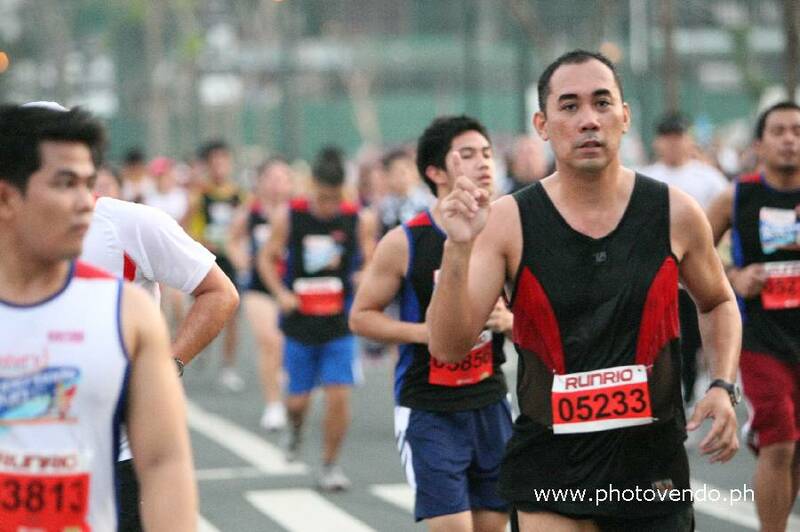 Runners were widely spaced after the 1st kilometer, and as a result, I still felt fresh after the race. I’ve submitted my fastest 5k since my comeback, with a final kick in the last 500m, caught 9 runners during that stretch. Great race overall. Next time, I’ll join their 1 mile race. Actual route was 3.6k as we did 3 rounds round the Boni High Street (1.2k per lap). First lap (1.2k) was fast in 6:16. Have to do more intervals as my throat went dry and was gasping for air with 2/3’s of the race still on the way. Managed to finish at 19:35 at 6th place ALONE, though my official time is 20.23 with 2 others. I entered this race with a hope of doing a 26 minute 5k. From the u-turn point at the 2.7k mark, I am running 40th-50th. Disaster struck with 1km to go. I made a wrong turn, instead of turning right for the 5k runners, I went straight and went with the 3k runners. Result was, I ran an extra 1 kilometer. So my time of 31 minutes is actually for a 6k race! Truly a frustrating and embarrassing moment. 3 days after the race, I bought myself a pair of contact lenses! No official results were released by the organizers. This was my first road race since the 1994 Milo finals where I ran a 5k as well. Nice to feel the adrenaline rush again. The 3k race was fired off 5 minutes ahead of the 5k race. As a result, after a modest time of 12:30 at the u-turn slot (2,5k), I drastically slowed down as I have to do a lot of lateral movements to sidestep my way from tail end of the 5k runners. It was very tiring from 3k to the finish line as more than 50% of my time from thereon was to think of the most efficient ways to pass group joggers and walkers. 29mins 12 seconds was my second to the slowest 5k, next only to the 31 minutes I’ve registered during my first 5k in 1984 as an 11 year old kid.